In the opening scene of Samantha Hayes’s new mystery What You Left Behind, a couple joyrides on a stole motorcycle, with deadly consequences. This scene winds it way through the novel, as DCI Lorraine Fisher goes to visit her sister Jo in the country, and stumbles upon mysterious characters and mysterious crimes. In the fictional village of Radcote, a cluster of teen suicides still haunt the community. Jo’s son, Freddie, is clearly struggling, upset about Jo’s separation from husband, Malcom, and whatever keeps him furiously gazing at his phone day and night. But what exactly is Freddie involved in, and what does it have to do with the family who lives in the manor house, who lost their son in the outbreak of suicides last year? Samantha Hayes proved herself a master of the red herring with the first book featuring DCI Lorraine Fisher, Until You’re Mine. 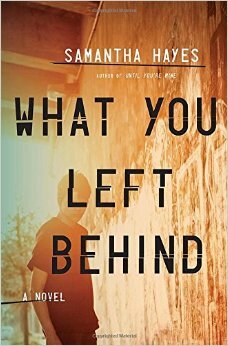 I recommend it, although you don’t need to read it to pick up What You Left Behind. One of Hayes’s best tricks seems to be to fall into stereotypical characters, and then pull out of them. There were several times, especially with Gil, an autistic (and suspect) member of the manor family who likes to take long walks alone at night, that I thought to myself,”Is she really stereotyping this character this hard? Am I really falling for this?” But (I’m not a fan of spoilers, so without giving too much away) Hayes manages, as she did with Until You’re Mine, to pull off a twist I totally didn’t see coming, as my attention was directed so many places. If you are looking for a compulsively readable, spooky and fast-paced series to take to the beach or the pool this summer, look no further, as Samantha Hayes has got you covered. I’m at that age, early thirties, where everyone is getting married and getting pregnant. So are the characters in this thriller, but with much deadlier results than an avalanche of wedding invites and adorable Facebook photos.